Approaching the Lihue Airport on the Island of Kauai we were given a spectacular view of the East Shoreline with lush green covered hills and reddish craggily peaks. It was breathtaking as our plane slowly descended and we could see the whitecaps pounding against the beaches of Kuahona Point and Kuwai Point. We saw a large sleek cruise ship sitting in Nawiliwili Harbour which is the cruise ship destination of Kauai. We got off the aeroplane and by the time we walked from the plane to the main baggage area our bags we’re already waiting for us beside the carousel! Never in my life had I seen baggage get to the carousel before passengers…ahhh…more of the magic of the Hawaiian Islands! 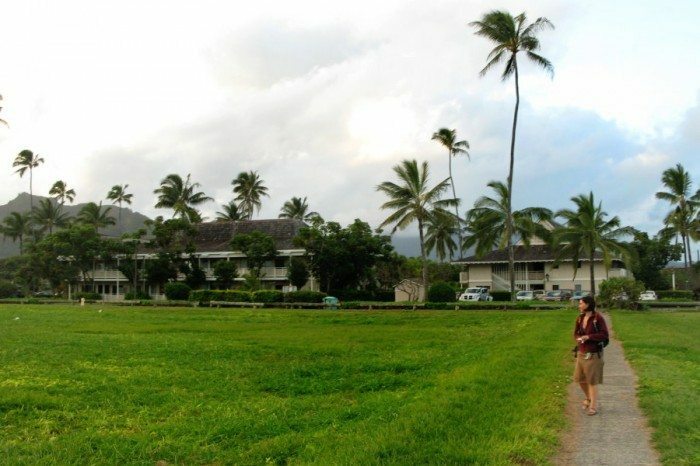 There were Leis around some people’s necks and the smell of sweet blossoming flowers everywhere and we made our way outside seeing the palm trees and mountains cradling the horizon to the West of the Lihue Airport. I am still reliving the flight from Honolulu and seeing the turquoise blue waters below us through the fluffy white clouds and then when we saw the coastline of Kauai it was unforgettable and my head was in a bit of a rosy pink daze as we made our way with our bags over to the car rental area to pick up our vehicle. We checked in at Dollar Car Rentals; we had reserved the SUV vehicle about four weeks before coming on vacation. They were very nice at the kiosk and we signed the papers amongst all the dozen or so others who were getting rental cars from various companies. It felt like something out of that TV show “The Amazing Race” as people checked in for their cars and then made their way to the parking lot trying to find their vehicles. This awesome silver Dodge Nitro was our chariot of fire on the Island! Dollar Car Rentals provided a clean and fast machine for a good price! Vrooom! This bad boy had serious acceleration and good passing power! 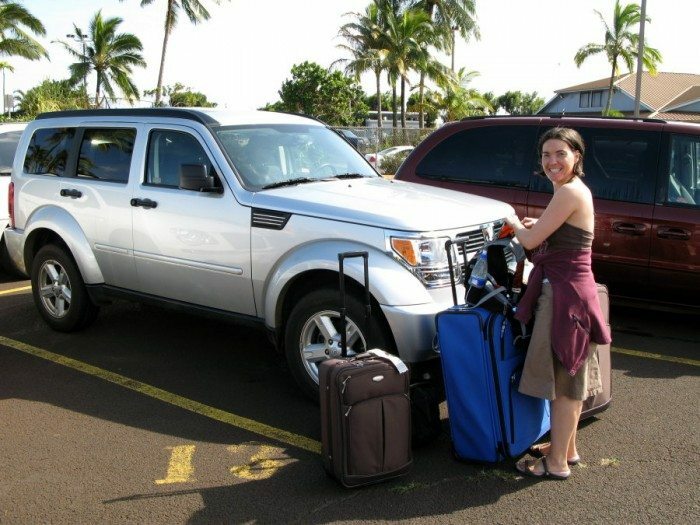 The sun was beating down and we wheeled out brand new suitcases into the parking lot looking for our vehicle…it was supposed to be a Jeep Liberty, according to the website when I reserved the car, but instead it was a silver Dodge Nitro! Whoa! That is one bad boy!! I took pictures of all the scratches in the exterior just in case we got any extra charges for having scratched it. It was a 2007 Model Dodge Nitro so was in great shape. After having only driven our own car for the last few years it was neat to suddenly be behind the wheel of an SUV which was much much larger than our little Pontiac Vibe…not that I don’t like my little Salsa colored car but this big-wheeled silver bullet was something else! We got on board, did a few high fives, and merged into the traffic along the palm lined highway 56 North towards Kapaa and our hotel we had reserved which was the Best WesternPlantation Hale which is about two miles South of Kapa’a at a little marketplace called the Coconut Marketplace. Actually we drove right past the turn-off at first because it came so quickly…we had been using a map but we had forgotten that even though the map was big the size of the island was small so we were not used to three inches of a map equalling only five minutes of driving time! Anyway we were glad that the hotel we had reserved, the Plantation Hale, was close to the Airport….we wanted to get checked in as soon as possible and not waste a lot of time driving on our first day. Walking towards the beach with the Plantation Hale Best Western in the background. We pulled into the parking lot and it felt totally like some tropical vacation resort…the lobby was open concept with the chairs and tables under umbrellas and the main check-in office was right outside with no windows or doors. It was hot and sunny and we were very excited! We checked in with a lovely woman named Elsie; an elderly Hawaiian sweetheart in a blue MouMou. She welcomed us and made us feel very welcome and told us we had a very nice room with a view of the ocean. She said seen away from work because her husband had passed away and she had been working at the Plantation for 30 years. She said we must have been special because we got a good room and DD told her how nice everyone had been to us. She gave us the key to the pool and it was a guitar shaped key chain and I said that DD was a musician and Elsie said her husband was too and then we talked about Anna Milligan, my grandmother who had passed away in 2006 and I told her that I had some of my Grammas ashes with me to spread in Hawaii and she told us about how a lot of her relatives had been scattered here in the Islands. It was a nice welcome indeed…but that was about the last nice moment we had at the Plantation Hale Best Western…in fact…after that the day turned into a nightmare! We got to the room number 13 at the Best Western Plantation Hale and DD freaked out because it was so dirty. There were cockroaches on the kitchen floor, the carpet in the living room was sticky, there were pubic hairs in the bathroom, crumbs under the cushions of the sofa, cockroach corpses on the bookshelf….the list went on and on. This was a nightmare for us! Our long term hotel rental turned into a catastrophe and we spent the first few hours actually cleaning up! We checked out the next day as it almost caused us to have a meltdown! Of course for me, being just a knuckle dragging guy, at first I thought the place was good enough because I was so excited to see the ocean view from the lanai but as DD started pointing out things that were dirty like a pubic hair on the bathroom floor and stains on the floors and mammoth dust bunnies on the wall and a the dead cockroaches I began to think that maybe this was a dump! It looked exactly like we saw on the website but I recall reading reviews on TripAdvisor and don’t remember anyone saying this place was a dump but we were standing there with our luggage with a bad feeling in our stomachs because we had booked the room for five nights and by the look on DD’s face she didn’t even want to stay one night! At that moment, as we stood there in shock, Elsie from front desk called to ask how everything was and DD told her it wasn’t as clean as she would like and Elsie said that wasn’t acceptable and apologized and sent up 4 cleaning ladies to the room to make things right. 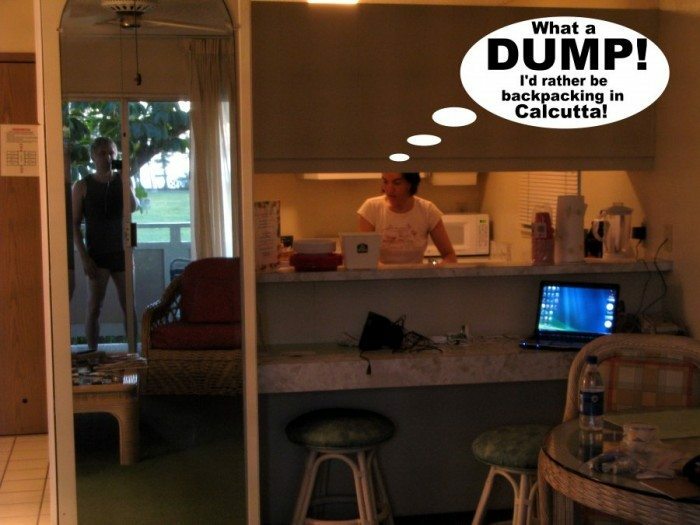 I sat on the Lanai watching happy couples wander towards the beach and was feeling a little queasy as I heard DD and the cleaning ladies in the room…I mean…this is no way to start a holiday! When they left I went back in the room and DD told me the cleaning crew was like a gang of complete nincompoops…they were like “What’s the problem?” as if they couldn’t see anything wrong! They actually sprayed cleaning fluid on the carpet and were mopping up the floor with a rag they dropped on the floor! They did such a half-assed job and we were like having a nervous breakdown because we didn’t know what to do! Elsie called again and DD was very upset saying the cleaning crew was inept and didn’t really help and the room was still a mess and Elsie said she’s send them back but we didn’t want the cleaning people here so Elsie said she would send the head of cleaning and so Debbie came up to the room with her cleaning products and she seemed very nice and agreed that the room was a mess. Since both DD and I were like practically in tears of fury I decided to go and get some groceries because we did have a full kitchen and stove so maybe once they finished cleaning the room we could have a nice meal. At the food store in Kapaa I bought a frozen pizza, some ice cream, some fruits, cereals, English muffins, peanut butter…all the essentials for starting a holiday but then I was like buying Mr. Clean, J-Cloths, Bleach and other cleaning products! Something isn’t right with this picture! Why should we be buying cleaning products? I mean, I just wanted to get the room up to standards and then go snorkelling and to the beach and all that fun stuff…from what we saw on the website the Plantation Hale Best Western had everything we needed, a big lanai, a fully stocked kitchen, a separate bedroom with two beds and a large floor plan that was over 600 square feet but the place was so filthy that none of that seemed to matter! I got back to the room and DD said Debbie had been very nice and had agreed that she had no reason to apolgize to me or to anyone for the place being dirty and for her not accepting a hotel room that was below standards. I unloaded the groceries and went for a walk on the beach because my head was spinning, my hyper-tension was at an all-time high, and I was trying to come to grips on how our vacation suddenly seemed to be going in to the toilet! 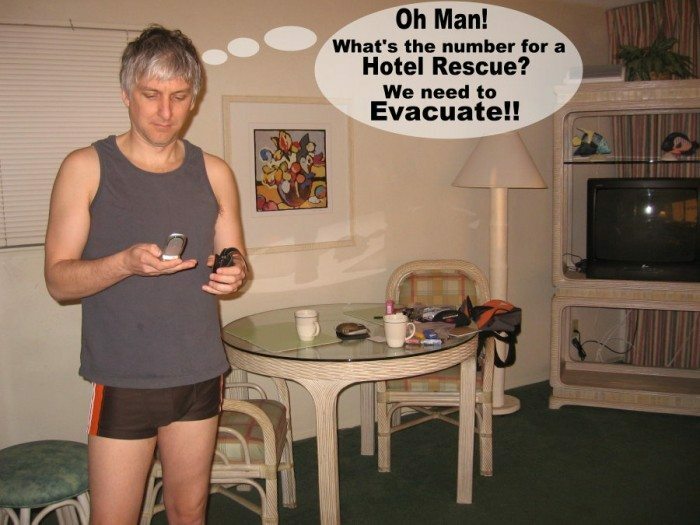 This hotel room was one time I needed to call a hotel emergency for a quick evacuation! I came back to our room from my short walk and had a beer and some Maui chips to take the edge off. DD was still busy cleaning up with the products I had bought. We cooked the pizza but the stove was dirty and we had to pre-wash the dishes and cutlery because they didn’t look clean. We ate at the table but the carpet was still sticky and there were finger prints on the lamps and smudges on the windows! It was horrible! We didn’t spend $6000 and come all this distance to be in Hawaii only to have to scrub our hotel toilets and do housework and then watch CSI on TV because we were too upset to talk to each other! It must have been at that point we decided to rename this place the Worst Western Plantation Hell! Even the bedroom, while it was big and likely was nice 20 years ago when it was new, was gross and the two beds weren’t exactly conducive to romantic evenings. We slept very poorly with a big space between us…both of us sad and almost thinking we should cancel our trip! Yep it was that bad! I guess we learned after that when we are confronted with an un-clean, pig-sty of a hotel room that we need to leave immediately and not try and be so nice and saying it will all be ok! It’s not OK and the fact they were nice to us at check-in doesn’t take away from the fact that the dingy complex of the hotel reminded us of a rundown ghetto and not the vacation resort our first impression had revealed. 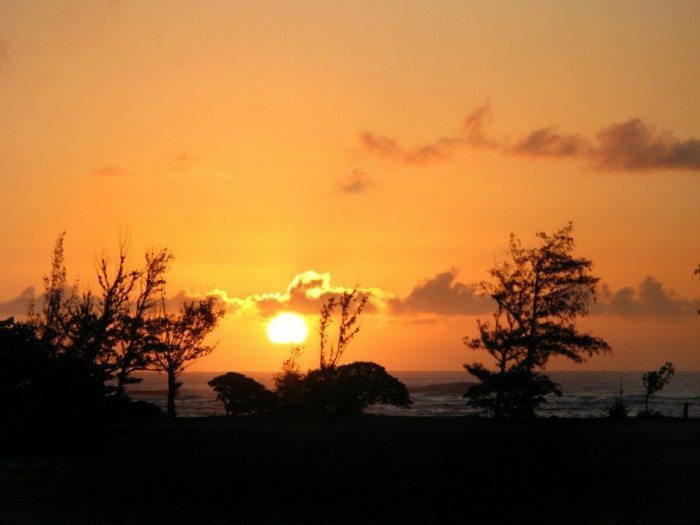 Sunset at Coconut Grove Marketplace, Kauai Hawaii. Although we were treated to a wonderful sunset and tried to make the best out of a walk from the hotel to the beach which was very close and did see some wonderful surf and nice mountains and things we still felt cheated and can’t understand how there were so many favourable reviews for this hotel on TripAdvisor because we hated it and will never stay there again. We checked out the next day and were glad we did because we found something much better than this grungy old run-down roach motel! Ack! I wouldn’t recommend this hotel to anyone! Maybe the number 13 is cursed because room number 13 at that Worst Western Plantation Hell almost sent us into a voodoo death trance! Kauai, The Napali Coast, Waimea Canyon, Kapa’a. 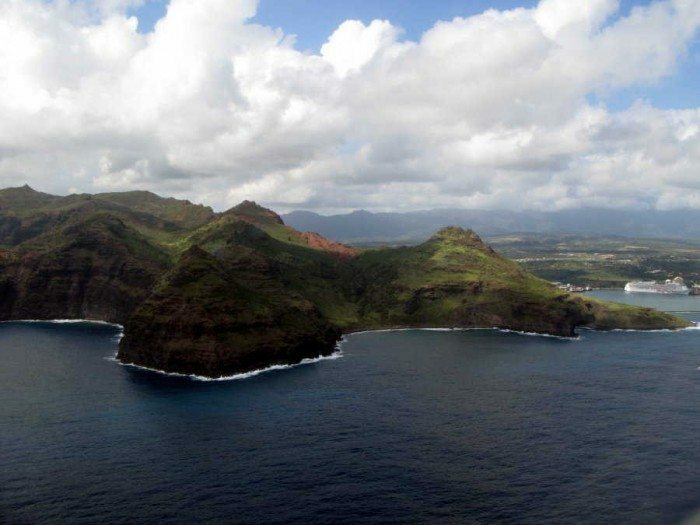 All our favorite hikes and sights on Hawai’is oldest island. Honolulu, Waikiki & the sights we saw on our short trip to Oahu. Volcano, Mauna Kea, Waimea, Kona, Hilo & the incredible Big Island of Hawai’i. Strange and unusual pictures that need a special category. Fun stuff and the beauty of Hawai’i that is hard to define. The artsy side of our trip to Hawai’i!